Reduced to £3990 from £4190. 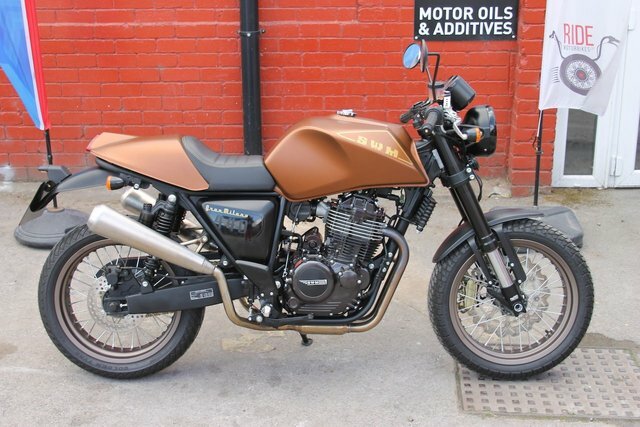 Here we have a 2017 SWM Gran Milano 440, Euro 3 in Bronze with only 149 miles on the clock. Finance deals tailored to your budget. Credit and Debit Cards Accepted. Remainder of the SWM warranty 10/08/2019. As you would except the bike is in cracking shape. We have the pillion seat boxed in the shop. The Gran Milano is a stunning road machine, styled and manufactured in SWM's Milan studio. A machine with superb balance and poise. They are a great performer, with high levels of torque available from it's fuel injected SOHC motor. Five-speed transmission completes the package, giving well-spaced gearing for effortless road use. Beautifully built in Italy using the highest quality components, and Italian styling that sets you apart from the crowd. Ride is a friendly down to earth business with a passion for biking. Nationwide Delivery, HPI Clear, PX Welcome, Friendly Customer Service. 01535 658811 ***Check out our customer reviews on the website, at Ride Motorbikes Ltd Facebook page/Autotrader shop and google*** For more information about us, the bike and our stock please visit our website. The adventure starts here! Open 7 Days A Week Ask us about Locks and Chains, Datatags, Helmets and Heated Grips. Stay warm and secure with Ride.